In this thesis we consider the application of methods and techniques from Operations Research in purchasing. In particular we study the use of such methods and techniques for supporting the selection of suppliers. In chapter I we discuss the background and rationale of this thesis. We show that the purchasing function already has a major impact (directly as well as indirectly) on the performance of organisations. In addition, we hold forth that developments in the international business and government environment will further complicate purchasing decision making and that (future) developments in business strategy and business structure will have much impact as well. Using De Leeuw’s control paradigm we contend that from the four necessary conditions for effective control of the purchasing-‘system’, the condition concerning the availability of appropriate decision models has not been met satisfactorily. Thirdly, we show that the undervaluation of purchasing during the 50’s, 60’s and 70’s has hindered the development of such models for purchasing. Therefore, we conclude that it is useful to invest research effort in developing supportive decision models for purchasing. In chapter II we define the objective of the thesis more specifically as to contribute to a further professionalisation of the purchasing function and especially purchasing decision making. The specific deliverables are defined as useful, explicit decision models (decision ‘tools’) for supporting purchasing decisions. In addition, the research should result in a toolbox for linking different situations to appropriate decision models. In chapter III we study the field of decision making and decision support. Given the objectives of the thesis we argue that from the established views on decision making in the literature the prescriptive view is most appropriate for this research. The normative and descriptive views are respectively related to the question how decisions should be made and how they are actually made, whereas from a prescriptive view we focus on how decision making in practice might be improved. In addition, (and unlike the normative view) a prescriptive approach includes all phases in the decision making process and not just the final choice phase. Next, based on the prescriptive view we construct a framework for analysing purchasing decision making. Finally, we define the term decision model from a prescriptive perspective. In chapter IV, we analyse decision making in purchasing using the framework we developed in chapter III. After defining purchasing, we conclude that several areas and levels of purchasing decision making can be discerned. First, decisions may be linked to the various activities within purchasing processes. Secondly, we may distinguish between such purchasing decisions and purchasing management decisions. A third distinction is the one between first-time decisions and subsequent ‘improvement’ decisions. Next, we arrive at a demarcation of the research as to the level and area of purchasing decision making to be studied. Based on a number of considerations we conclude that supplier selection constitutes a relevant and appropriate demarcation. Subsequently, we use the framework from chapter III for analysing the literature on supplier selection. This analysis shows that supplier selection decisions may differ strongly in terms of the nature and the level of complexity. In addition, also the impact of the supplier selection decision varies and co-determines the decision making approach taken. Based on the results of the analysis, we conclude that we need different decision models for different (supplier selection) situations. The decision models should enable the modelling of different levels and forms of complexity in supplier selection while remaining practical in relation to the importance of the purchase. 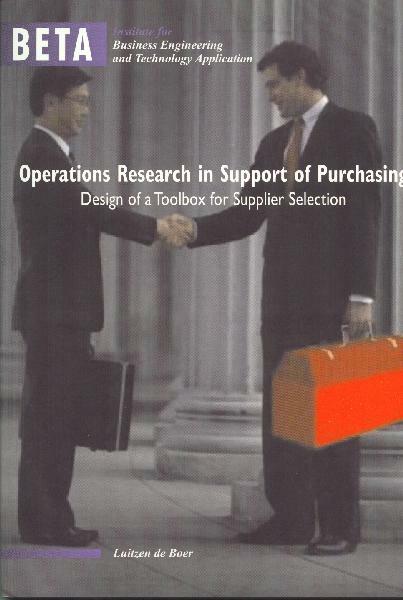 In chapter V we analyse the literature regarding the available decision models for supplier selection. Our main conclusion is that Purchasing as well as Operations Research (OR) researchers have so far focused on one-dimensional (quantitative) and compensatory decision models for the choice phase in the supplier selection process. From the available models in the literature we briefly mention the main categories. Categorical models and Neural Network applications for supplier selection are choice models in which the decision rules remain implicit. Cost-ratio, Total Cost of Ownership and Decision Analysis applications strictly include quantitative (financial) criteria. Linear Weighting models employ compensatory decision rules. Finally, Mathematical Programming, Cluster Analysis and DEA all use quantitative criteria as well. Very few decision models present in the literature support the problem definition phase in supplier selection or employ non-compensatory (screening) decision rules. However, in chapter III we concluded that these aspects are (also) very relevant when it comes to supporting supplier selection decisions. In chapter VI we present the results of an extensive investigation of the (Operations Research) literature regarding possibly useful decision models for supplier selection. Summarised we conclude that OR offers many useful decision models for supplier selection that so far however have not been used for this. First of all, we found that there are various decision models available for supporting problem definition in supplier selection. Such decision models can be used to investigate the need for supplier selection, generate possible alternatives or aid in generating and evaluating supplier selection criteria. In addition, we found various decision models for the choice phase in supplier selection which contain the features that were not present in the available decision models for supplier selection (which we mapped in chapter V). Among these features are non-compensatory decision rules, group decision making and handling imprecise data. All in all, we conclude that OR offers many useful, complementary decision models for supplier selection. Chapter VII deals with the construction of the toolbox for supplier selection as we set out in the objectives of the thesis. The construction process follows four steps. In the first step, starting points and design specifications are defined. The starting points cover basic assumptions about the factors that determine the choice of a decision model in a certain supplier selection situation and the characteristics of the situations in which the box may be used. The design specifications indicate the desired functions and characteristics of the toolbox. In the second step, we create compartments in the toolbox to represent different types of supplier selection situations as well as different levels of complexity and importance. Subsequently, within each compartment, we construct subcompartments to cover the different phases in supplier selection: problem definition, formulation of criteria, qualification of suppliers and the final selection of suppliers. Also, we show how the subcompartments can be used to plan supplier selection processes. Finally, we fill the subcompartments in the toolbox with the decision models we mapped and investigated in the chapters V and VI. Chapter VIII deals with the question how to measure the actual usefulness of the toolbox and the decision models in it. Basically, three methodological issues are addressed. First, after studying the literature on methodology, we define the criteria to be used when evaluating the decision models. Secondly, we consider the various research strategies available. Given the purpose of the research, we conclude that a (pre-test post-test) experimental strategy is most appropriate. Finally, we address the assurance of the validity and reliability of the research design. In chapter IX we describe in detail the practical application of the toolbox in four experiments based on four different supplier selection cases. In the experiments, we (afterwards) reconstruct the supplier qualification and selection processes from these cases, yet this time using the toolbox. The first experiment took place at Grolsche Bierbrouwerij (brewery) Nederland BV. The case concerned the qualification of suppliers of beer bottles. Following the prescription of the toolbox we tested several models in this experiment. We used WWS-analysis to explicate the need for the qualification. Next, we used brainstorming and Rough Sets to generate and evaluate qualification criteria. Finally, we applied AHP and Promethee to perform the actual qualification. The second experiment was performed at Honeywell Combustion Control Center Europe and concerned the qualification of a second supplier of moulded coils. In this experiment, we applied Value Focused Thinking to evaluate the need to qualify such a supplier. Next, we used brainstorming to identify supplier qualification and selection criteria. Finally, we applied SMART to perform the final qualification and Goal Programming to allocate the order volume to the suppliers. The third experiment was carried out at the Facility Services department at the University of Twente and concerned the purchase of a telephone exchange system. Following the prescription of the toolbox for this case, we first used WWS-analysis to check the need to purchase such a system. Next, brainstorming and ISM were used to identify and analyse selection criteria. Finally, AHP was used to select the supplier of the system. The fourth experiment was performed at the Central Military Hospital in Utrecht. This experiment was based on the case of purchasing a blanket-heater. Again, following the prescriptions of the toolbox, we applied several decision models. We used FFA-analysis to generate possible alternatives for this purchase. Brainstorming was again used for identifying selection criteria. Finally, Linear Assignment was used to select the supplier of the blanket heater. In chapter X, we deal with the evaluation of the use of the toolbox in the experiments. The evaluations resulted from interviews with the purchasers who had been involved in the experiments. The interviews were centred on the 13 criteria for the evaluation of the toolbox as defined in chapter VIII. Throughout all phases in the different experiments, the purchasers considered the outcomes of the decision models acceptable and useful. As to the aggregation and processing of information in the decision models, the purchasers indicated that only the decision models for supporting the phase of problem definition required somewhat more explanation and structure. The evaluation showed that in the experiments, the decision models sufficiently used the available information and sufficiently allowed for the expression of opinions. In addition, the purchasers regarded the decision models sufficiently flexible and the efforts/investments of using the models justifiable. However, not all decision models were found to be sufficiently user-friendly. Finally, the evaluations showed that the purchasers involved in the experiments considered the decision models to contribute to the purchaser’s decision making skills as well as improved communication and justification of their decisions. In chapter XI we draw final conclusions about the research. First of all, we conclude that the toolbox developed in this thesis may offer useful and comprehensive support for supplier selection. More specifically, the toolbox may be useful throughout the whole supplier selection process and in different (typical) purchasing situations. The usefulness of the toolbox comprises several dimensions. The box may aid the purchaser in generating and evaluating alternatives for supplier selection as well as the criteria to be used. The toolbox may also create a more transparent, objective and consistent decision making process and aid the purchaser in effectively utilising the information available to him. Also, the purchaser may use the toolbox to improve the justification of and the communication about the supplier selection. Furthermore, the toolbox enables the purchasers to achieve all this against justifiable efforts and costs. Also, we conclude that the use of the toolbox is not restricted to specific purchasing packages or sectors of industry. Secondly, we conclude that limited redesign could further improve the toolbox in some aspects. Some decision models for problem definition could be made more structured and additional recommendations concerning the practical use of the toolbox could be included. Also, in some subcompartments, the decision models could be grouped further into subgroups. Besides, we already delivered a possible way of doing this. Thirdly, we conclude that (limited) training of purchasers in order to familiarise them with basic decision making concepts and a modest investment in software is required for effective, self-sufficient use of the toolbox. Finally, we conclude that the thesis ‘along the way’ developed some useful scientific ‘by-products’. The thesis provides a comprehensive and state-of-the-art overview of supplier selection models in purchasing literature and offers a novel way of modelling purchasing processes and decisions. In addition, the so-called Supplier Selection Decision Decoupling Point – concept introduced in this thesis may prove useful in other fields of management decision making as well. At last, the experiments carried out in the thesis constitute a useful complement to the established research traditions in OR and Multi-Criteria Decision Making.